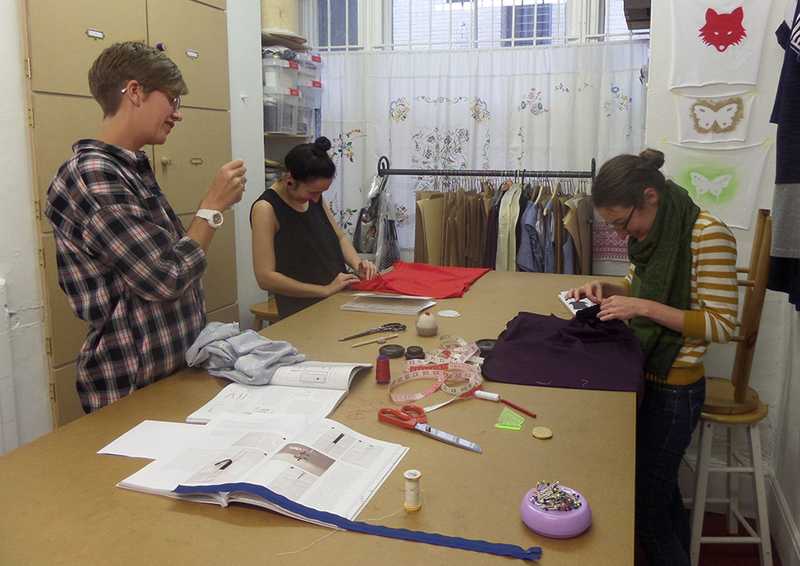 Three new sewing converts busy making t-shirts while two more feed their existing habit next door making a shift dress and fishtail skirt. Yesterday was the first Sunday workshop based around my new book. Judging by the end results and what the students thought of the day it was a great success! 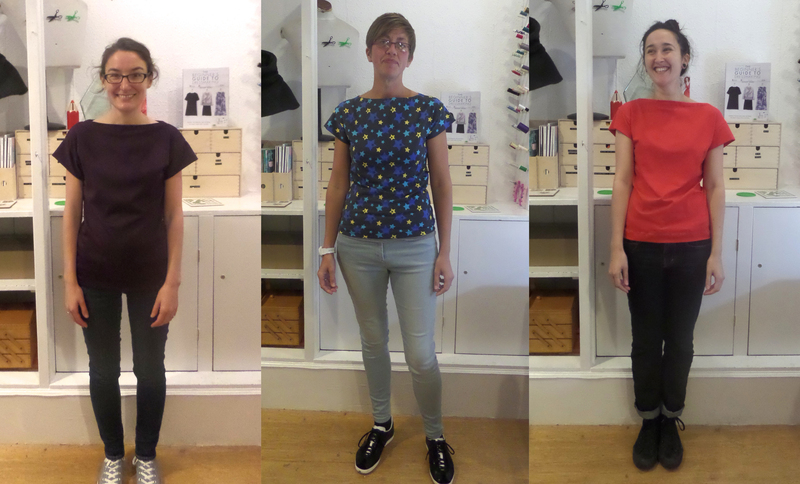 Here are three fabulous t-shirts made by three complete beginners to dressmaking. From left to right: Beth in a beautiful rich purple ponte roma version, Natalie in her printed single jersey version and Emily in a zingy bright red single jersey version. All three went off inspired to make more t-shirts, in fact they had all already got fabric lined up for their next ones and Emily (who is a graphic designer and book-binder) is planning to start screen-printing hers. I look forward to seeing those! 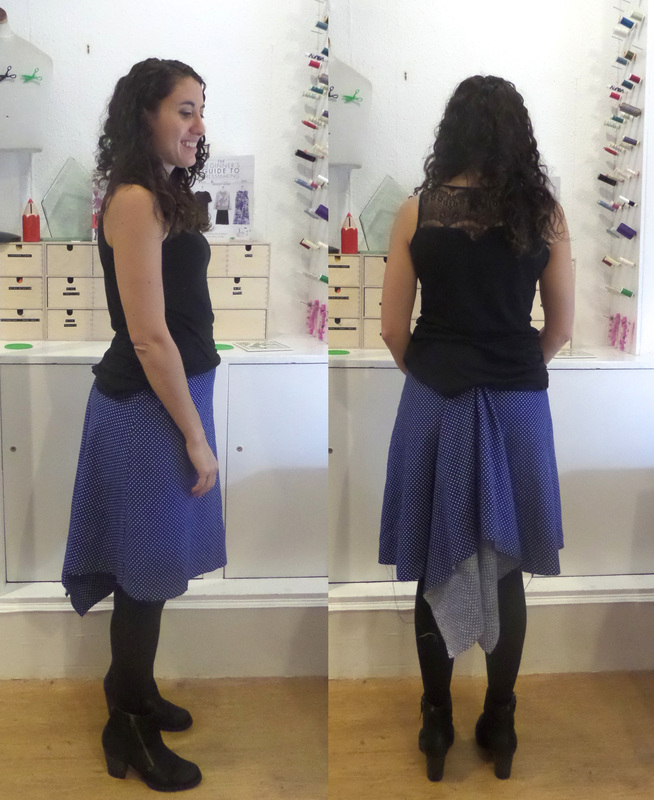 Here’s Mel in her oh-so-close-to-being-finished fishtail skirt. Fitting perfectly and looking fabulous in a fine needlecord with a tiny polkadot. And Salva got a good way along with a short sleeved shift dress with a collar in electric blue needlecord – I can’t wait to see the pictures of that one finished. 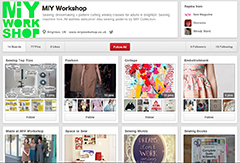 This entry was posted in Full Day Classes, MIY Workshop, Sewing & dressmaking, Student work and tagged beginners guide to dressmaking, bgtdm, learn to sew brighton, MIY Workshop, sewing classes Brighton, Wendy Ward. Bookmark the permalink.